Adding new employees to the payroll requires timing that coincides with revenue growth, while at the same time a growing business will require specialised skills that current staff may not hold. For small to medium businesses in particular, outsourcing certain roles saves money and adds valuable expertise without adding permanent staff to the payroll. Saving money and adding efficiency in the back office operation ensures that the revenue-producing roles remain focused on providing products and services to customers. Business owners are wise to focus on the core business while supporting functions are outsourced. Economies of scale offered through outsource providers will leverage every dollar without hiring people, buying equipment and learning the intricacies of legal requirements. Hiring an IT Company to look after your server backups, network support and desktop support issues is the most important role to outsource. These tasks require highly skilled technicians with knowledge of a wide range of technologies. More importantly, someone with these specialised skills would not be put to good use in-house until issues arise, which makes it much more cost effective to have an IT company on call than an in-house team, particularly in an small to medium businesses. In addition, employee computer training is available through many IT companies. Some PC challenges can be handled without contacting the provider for phone or onsite support if employees have been trained sufficiently for simple issue solving, while more complicated IT support functions can be outsourced to augment the office staff whenever additional expertise would be helpful. Advertising in the traditional sense has been replaced with focused efforts to reach online target markets. Online Marketing Specialists should be contracted for their specialised services, including SEO, Paid Search, Content Marketing and Social Media Marketing. This is because changes in this field occur rapidly and require individuals to constantly research and keep up with emerging trends and strategies. Businesses trying their hand at online marketing in-house could be doing more harm than good, with mistakes in social media etiquette or black hat SEO techniques potentially destroying their reputation, ranking and authority. In some cases, the business owner may choose to assume some duties in house by assigning the task of updating the social media pages to an existing employee, but only after extensive training from an outsourced agency. Commercial buildings require maintenance and repairs in addition to regular cleaning services. Business owners are wise to select a facility management provider in the community with a reputation for maintaining property. Expertise in property management is worth the investment to sustain the condition of the property, particularly if the property is an owned asset. Facilities management providers offer services that are tailored to the customer’s needs. Unique property features will be maintained through the outsourcer without hiring employees. Business owners make requests for various services and inform the provider when deadlines exist. Physical security of the property is important when expensive equipment is stored in and around the building. Security system installation and monitoring is part of the security services contract. Business owners will rely on the provider to enhance security procedures as the business grows or moves to new facilities. Additional staff is added to the provider’s staff as customer needs change. Businesses with employees must comply with laws that include tax withholding practices in payroll functions. Payroll service providers perform all necessary functions in compliance with state and federal payroll laws. The business owner provides the funds in time for schedule paydays throughout the calendar year. In addition, finding the right candidates for new roles can be difficult for time poor business owners who may not be well versed in what to look out for in potential candidates. 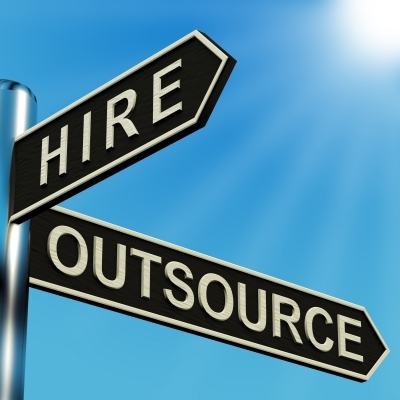 For this reason human resource and recruitment functions are also often best outsourced. Provider selection – whether it be choosing an IT company or a recruitment agency – is similar to other business partnerships where suppliers, vendors and creditors are chosen. Business owners will want to follow a careful strategy to determine the strengths each outsourcer would bring. Size and fame are not the most important factors when determining which company would offer great support. Ultimately efficiency and experience are the important traits of quality outsourcers. Long delays and steep learning curves will cause issues that are worse than having to hire and train employees. Business owners should seek referrals from peers and competitors who have worked with the outsourcers to verify their sales pitch is accurate. Sorcha Mullis works for White Chalk Road, an Australia based online marketing firm, and writes on tips for small to medium business owners. Follow her at Twitter.